A discussion, and sound samples of flute crowns and stoppers by Robert Bigio and Dyna Flute System for the flute headjoint. I spoke with Raymond Robinson, flutist and teacher, from Ireland. 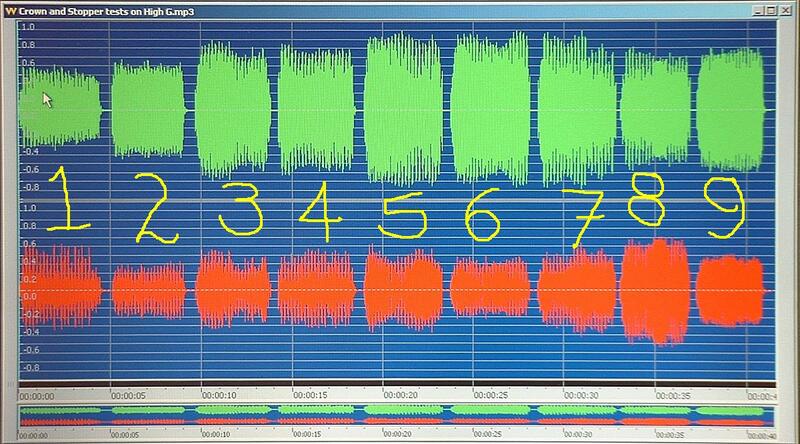 Hear individual crown-stopper sound files and see graphs below. March 2007 ~ Fluteloops 8 (mp3) is 10 minutes in listening time, featuring discussion, ideas and some great flute music from Sharon Bezaly's "The Israeli Connection" CD. TEXT: Raymond's description of how he recorded the crown/stopper and 'Dyna System' flute sound samples that are shown and heard below. 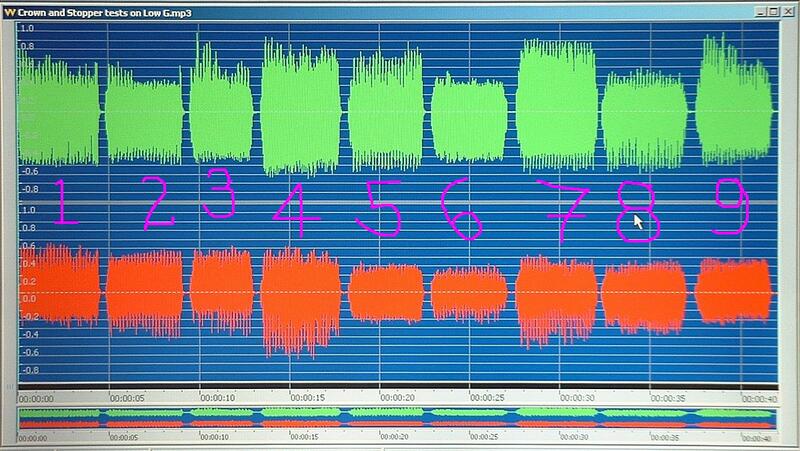 Raymond's description of how he recorded the sound samples that are shown and heard below. No 1 - The Miyazawa head with its original cork assembly and crown. This is already a good set-up as the crown is solid silver throughout and therefore heavy. No 2 - The Dyna system with all 8 vanes and the adjusting screw in the crown fully screwed in. No 3 - The Dyna system with all 8 vanes and the adjusting screw in the crown assembly removed. No 4 - The Dyna system with 4 vanes and the adjusting screw in the crown assembly screwed in. No 5 - The Dyna system with 4 vanes and the adjusting screw in the crown assembly removed. No 6 - The Bigio Delrin Stopper and Wood Crown. No 7 - The Bigio Delrin Stopper and Zirconium Crown. No 8 - The Bigio Zirconium Stopper and Wood Crown. No 9 - The Bigio Zirconium Stopper and Zirconium Crown. Above are two short sound files (mp3). I basically played a variety of stopper, crown set-ups on my Miyazawa flute ( A solid silver MC-375E heavy wall made in 1996 - equivalent today to the Classic model). The tests where set-up so that I played from the same position from a mic each time, the headjoint was fully pushed into the flute so it was in the exact same position each time (that is why all the notes sound sharp), I tried as best as possible to play from the same embouchure position using the same amount of air. I played the notes longer than the sound files recorded so I could get a "settled" sound. I then edited the sound files for each combination onto one track so they notes would sound one after the other. For the tests I played a long low G and a long High G for each combination. I recorded the sound files onto a Sony MiniDisc recorder using a standard mic. The sound files were not processed in any way so the sound on the files is the exact sound as played. During the tests when I loaded them into the editing software, for the Low G there were noticeable volume differences, No 2 and No 3 were basically the same volume as No 1, however No 4 and No 5 were louder. In the Bigio system adding the Zirconium Crown to either the Delrin Stopper or Zirconium Stopper increases the volume of the flute compared to the Wood Crown, suggesting that weight does have an effect. The difference between the Delrin and Zirconium Stopper is less marked but the Delrin stopper as the player makes the flute feel stuffy compared to the Zirconium. For the High G test there is less of a difference in sound and volume levels. I want to get the message across that although these new devices do have some effect, a scientific explanation has not been devised and if they work for you and make you feel more confident in your playing then certainly use them. It all comes down to personal choice, however if you practiced another 15-30 minutes every day you will find that your playing will improve much faster than what a crown or stopper assembly might do for you. Go to Fluteloops No. 9 with the "tone colours of 16 flutes experiment."